And maybe attitude counts for something. Consider how Mayor Edna Jackson has conducted herself in her first year. Whatever one thinks of Jackson’s predecessors Floyd Adams and Otis Johnson, I doubt the word “bubbly” will come to mind. We haven’t exactly had vivacious city managers either. Sure, dour personalities can turn out to be great public servants, and smiling faces can mask sinister plans. But it’s been great to see Mayor Jackson’s optimism and cheeriness set the tone for so many public events. Her enthusiasm is infectious. We could use more community leaders who so obviously love living here. 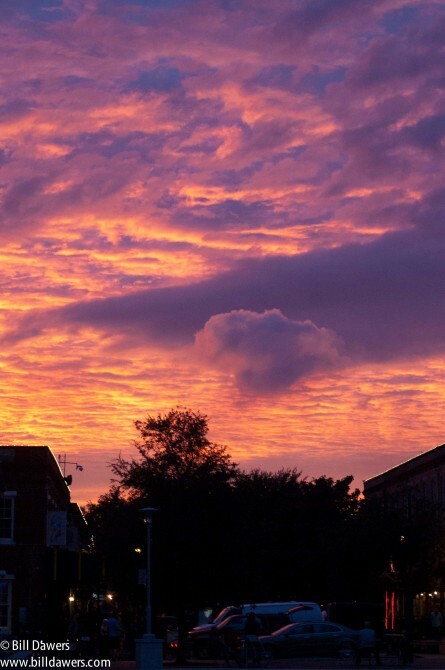 A recent sunset over City Market, as seen from Ellis Square. The mood at Ctiy Hall on Thursday was noticeably different. After months of tension and questions about city management, council members and visitors at City Hall noticed the same thing: a relaxation, even a light-heartedness that had been lacking. There’s much more in the post. Savannah is such a fun-loving city in so many respects, with festival on top of festival and big events increasingly pitted against each other, especially in the fall and spring. And Savannah is a city that sometimes inspires awe, too, but at the same time we seem to get caught up in an inordinate amount of petty wrangling. Maybe we can shake off the recent trend of dour, draining leadership.